Supplies used -- Stamps: Not So Boring Border by Stamping Bella, sentiment by Rubber Soul; Paper: patterned paper by the Paper Studio, Georgia Pacific White, SU! cardstock in Tempting Turquoise, Basic Black, Certainly Celery, and Cameo Coral; Ink: Brilliance Archival Graphite Black, Palette Hybrid Noir Black; Accessories: Copic markers, SU! 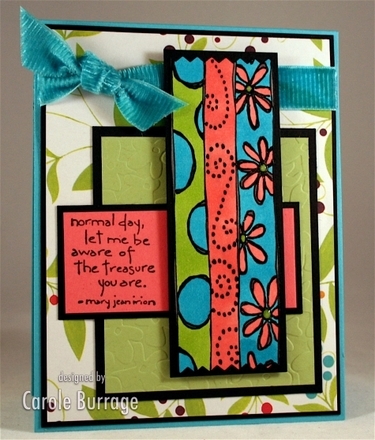 Perfect Layers, pinking shears, Glossy Accents (for flower centers), Dimensionals, Fiskars Texture Plates, ribbon. You got it! Miss Diva is coming home from doggie-training school at long, long last! 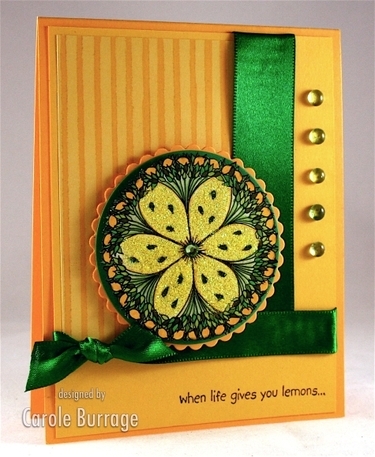 So I made my card for Jen's Sketch For You To Try in Diva's honor. Don't you just love the little crown brad? I thought it was perfect for our puppy princess. Be sure to check out what Shannan Teubner and Susan Liles did with this great sketch, on Jen's site you can see not only her sweet sample but also a gorgeous floral created by her guest designer, Amy Sheffer (aka PickleTree on SCS). If you're inspired to use this sketch -- and really, how can you not be?! -- when you upload it to your SCS gallery, be sure to tag it with the keyword "SFYTT" so that we can be sure to check it out. 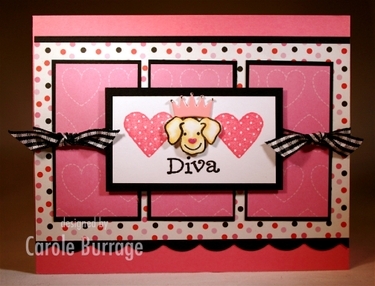 Supplies used -- Stamps: Dog by Rubber Soul, sentiment by Art Gone Wild, Loving Hearts by SU! ; Paper: Regal Rose, Basic Black, Georgia Pacific White, patterned paper Loves Me by SU! and dots by SandyLion Designs; Ink: Regal Rose, Basic Black, Brilliance Archival Graphite Black; Accessories: Copic Sketch and Spica markers, crown brad, ribbon, corner punch, dimensionals. We pick Diva up tomorrow. I'm a bit leery, I have to confess. Truman (my 11 year old) has been on me for a couple of weeks to find out when exactly we'd be getting her back. I had called the trainer when I got back from Michigan in mid-December, but she acted like Diva had a ways to go partially because of the ice storm interrupting her training and because she -- the trainer -- had gone through a bout of pneumonia. Well, that was three weeks ago, and initially training was only supposed to be 6-8 weeks. And Diva has been there since mid-October. So I made the call. The trainer said, "How about Sunday?" Great! I responded. Are we coming for a visit or to take her home? She laughed, "Whatever you want." "Well, what do you recommend?" "She has such a strong work drive," the trainer said. "Some dogs are immediately great family dogs. They want nothing more than to come inside and lay at your feet and be petted. Then... there are other dogs, and their work drive is really, really strong. And Diva has one of the strongest work drives I've come across." This is a woman who trains police dogs, search and rescue dogs, etc. I would think she's seen her fair share of dogs that like to work. "Um, I'm kind of confused by what you mean by 'work drive.' Is that a euphemism for 'crazy?'" Welcome, 2008! I love New Year's Day -- don't you? I adore the idea of a fresh start, a clean slate, another chance to start over and get everything right. Sure, I appreciate yesterday and enjoy good memories of what's been, but I'm much more interested in whatever it is that I'm doing now, or what might be in the future. Maybe that comes from being a kid who went to several different schools and moved around a lot, but whatever the source, it's who I am. I love a new adventure! And a New Year is just that. So, Happy New Year, friends! Color Goddess Emily posted the SCS Color Challenge a little early, and as indication of my wild and crazy New Year's Eve, I'm posting mine at 10:03 p.m. on New Year's Eve. Woo-hoo! The challenge was to use Taken With Teal, Real Red, and Certainly Celery. This is one of the new images I received for Christmas from my DH (gotta love the Wish List capability at Addicted to Rubber Stamps). I've long loved this fun image and I'm so glad to call her mine. She so reminds me of Marjane Sartrapi's Persepolis graphic novels which are, in my estimation, some of the best graphic novels since the Maus series by Art Speigelman. I'm convinced that rubber stampers have a keen appreciation for comic strips somewhere in their past. Am I right? Or are you the exception? I'd love to know whether or not you agree with my hypothesis. Happy New Year, friends! I look forward to a fabulous 2008 with you, and I wish you happiness, health, harmony, and of course, HUGS! Supplies used -- Stamps: Happy Mom by Rubber Soul, sentiment by A Muse; Paper: Taken With Teal, Real Red, Certainly Celery, Georgia Pacific White, patterned paper by Crate Paper; Ink: Brilliance Archival Graphite Black, Real Red; Accessories: Copic Sketch markers, Nestabilities, Marvy Uchida Giga Scallop Circle Punch, paper piercer and mat pack, small hole punch, ribbon, 3-D Dots.